Although I write … or usually can write when I’m not as depleted as I’ve been lately … any other artistic skills escape me. My oldest daughter is a wonderful artist, as is my youngest son, and my older son is a musician, but I live within the limitations of words. This being a rainy day in Seychelles and me doing what I can to keep the kids busy, happy and living with a semblance of normal life, we needed a project for this dreary Sunday. 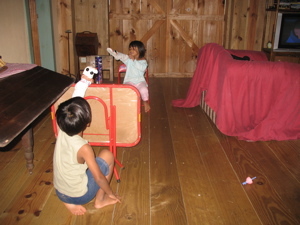 With some donations of scraps and bits from my dear friend, Andrew, we made sock puppets; then Sam put on puppet shows for Cj and me. Good thing the kids aren’t too picky about perfection in puppets, as my design and application leave a lot to be desired. Working together helped, even though I now have about 3 dozen tiny holes in my fingers. It’s so good that some things still bring such a big smile with them. 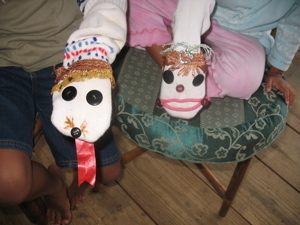 Sock puppets rock!! Too cute……. I am glad you all had a fun day in spite of all the recent sorrow. I can empathize with the heaviness of depression, even if our situations are not the same. I have been suffering from my own sad situation since January with no end (or at least a happy one) in sight. Wow! Those are some great sock puppets! I’d love to have seen the show. The kids look so cute. They must have enjoyed themselves very much. I hope you are feeling better. I’m glad you have a dear friend with you. You need some one-on-one contact with someone who cares. I wish with all of my heart I could be there for you. It’s difficult to settle for being with you in heart and spirit. My thoughts and love are with you. Keep holding on Sandra. Playing with my kids is the best therapy I know when I am down in the dumps. Exercise also helps, even just a quick walk. Hang in there, Sweetie!! You will make it, and come out stronger. I am praying for you. 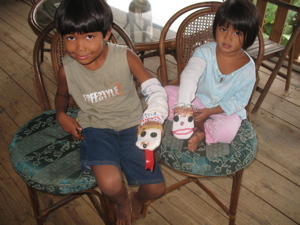 The puppet is a nice idea for the children.I will make it with my kids.